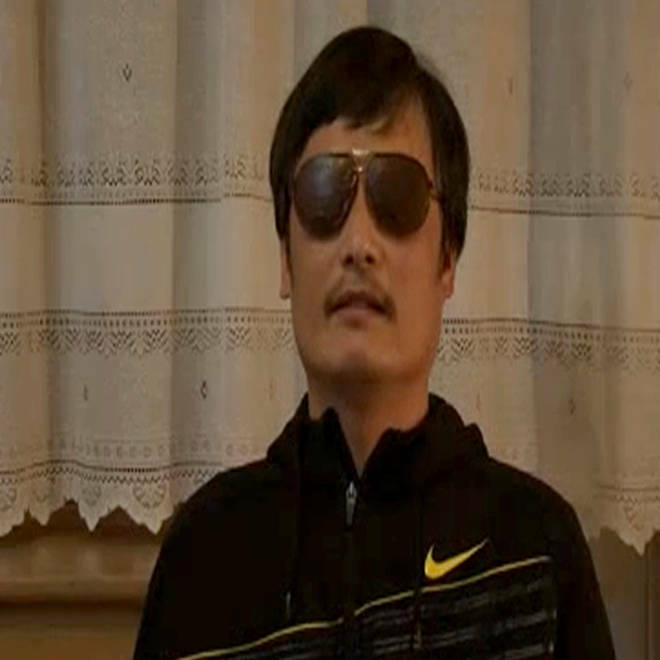 This image grab taken from a video which was released on Friday shows Chen Guangcheng, a blind Chinese lawyer, speaking following his escape from house arrest. Reuters reported that one person on a Chinese social-media site wrote that Chen "has escaped from the clutches of the devil." BEIJING -- Chen Guangcheng, a blind lawyer who is also one of China’s best-known human-rights activists, has escaped after spending one-and-a-half years under house arrest. Reuters reported that Chen, who campaigned against forced abortions, had been restricted to his village home in Linyi in eastern Shandong province since September 2010 when he was released from jail. Groups of local thugs watched him 24 hours a day and stopped anyone who tried to visit him, sometimes using violence, including scuffling with Hollywood actor Christian Bale. He Peirong, an activist and longtime friend of Chen, said on Twitter that the lawyer fled on April 22. Chen once tried to dig a tunnel in a bid to break out. However, his plan was discovered and the guards, allegedly appointed by the local government, paved cement over the ground outside his home to prevent any further attempts to flee. He Peirong told Britain's Times newspaper that Chen had planned the escape for months. She said Chen climbed over a wall while a guard wasn’t paying attention, crossed a river, and then managed to meet a friend who picked him up and drove him to Beijing. Reuters cited Bob Fu, president of the Texas-based religious and political rights advocacy group ChinaAid, as saying that Chen was in Beijing and "100 percent safe." Chen’s whereabouts remained unknown on Friday. Rumors swirled that he may be hiding inside the U.S. Embassy in Beijing, but officials said "no comment" when approached by media. Boxun News, an overseas Chinese news website, uploaded a recorded video of a monologue by Chen early Friday, with a headline reading "Chen Guangcheng's three requests to Premier Wen Jiaobao." The 15-minute video started with Chen’s brief statement: "Dear Premier Wen, it was very difficult but I made my escape. I am here to prove, all those allegations online and the accusations against Linyi (government)’s violence on me are true. And the fact is only worse." His first request to the premier was a thorough investigation for his house arrest, and to severely punish the criminals in accordance with law. Chen claimed dozens of people had been sent to his house, violently beat up Chen, his wife and his mother on multiple occasions. Chen named all the people who were allegedly involved, including the one who roughed up Christian Bale and CNN TV crew last winter. Chen also gave details of how thugs were grouped to watch and patrol in and around his home, by roads leading to his home and the village, sometime even in neighboring villages. Security cameras were installed around his house and all connections between his home and the outside world were shut off. Chen’s second request was to safeguard his family members' security: "I’m free now, but I worry about my wife, my child, and my mother. They’ve been persecuted for so long and I’m worried they will be victims of revenge." Chen says his wife has been beaten many times and was prevented from seeing a doctor. Chen’s seven-year-old daughter was also constantly watched and sometimes even had her school bag searched. She wasn’t allowed to leave home after school. The electricity of Chen’s home was constantly cut off and his mother wasn’t allowed to go shopping. "I will keep on fighting if anything happens to my family," Chen warned. Chen's last request will resonate with many Chinese citizens: to curb corruption. "When they were persecuting me last August in a Cultural Revolution style, they said, ‘we have spent even more than 60 million Yuan ($9.5 million) on you, but that doesn’t include the money used to bribe officials in Beijing!’…what a corruption." A huge amount of public money is used to crack down protests and human-rights movements, under the name of the "stability maintenance fund." In Chen’s case, he estimated millions have been spent just to keep him locked up. "The officials say they didn't get much and the largest share was taken by others. So, clearly, there is serious corruption and the abuse of tax money and power." His escape was widely discussed on China's popular Twitter-like service Weibo, with users referring to him as "the blind man" or "Shawshank Redemption" to avoid censorship of his name. "Some birds aren't meant to be caged. Their feathers are just too bright," the line from the 1994 drama film "The Shawshank Redemption" has been forwarded many times on Weibo today. "Every historial period has its own blind prophet. He speaks out the fear hidden in the hearts of those who can see," said a Weibo user by the name of "Zhang Wenwu." Born in 1971, Chen became blind after suffering a fever when he young. He studied medicine and later turned into a self-taught lawyer, providing legal support for disabled people and other fellow villagers over their land dispute with local governments. Since 2005, he campaigned against local family planning agencies on human rights violations including forced abortion, forced sterilization, beatings, fines and illegal arrests. He was sentenced to four years and three months in prison in 2006 for the crime of "deliberate destruction of property and disrupting traffic." He had been under house arrest along with his family since his release in 2010. He Peirong, the friend and possible collaborator who published the news, has not been heard from since this morning. Her phone was picked up by a man who told journalists "you’ve got the wrong number." It is not known if Chen’s family has been subjected to reprisals at the moment. Chen ended his speech with a question: "Premier Wen, if you continue to neglect this, what will people think?"